이니스프리 제주하우스 삼청점은 제주에서 발견한 생기 넘치는 아름다움을 전하는 도심 속의 힐링 공간입니다. 이곳에서는 먹고(eat), 만들고(make), 키우는(grow) 자연의 순환을 직접 경험함으로써 진정한 아름다움이 담긴 이니스프리 그린라이프를 체험할 수 있습니다. 제주의 돌담을 재현한 파사드와 제주 해녀의 바구니를 닮은 조명은 제주에 품은 다양한 추억을 떠올리게 합니다. innisfree Jeju House in Samchung-dong is a place where city dwellers can come to rest and experience the natural cycle of eat, make, and grow. 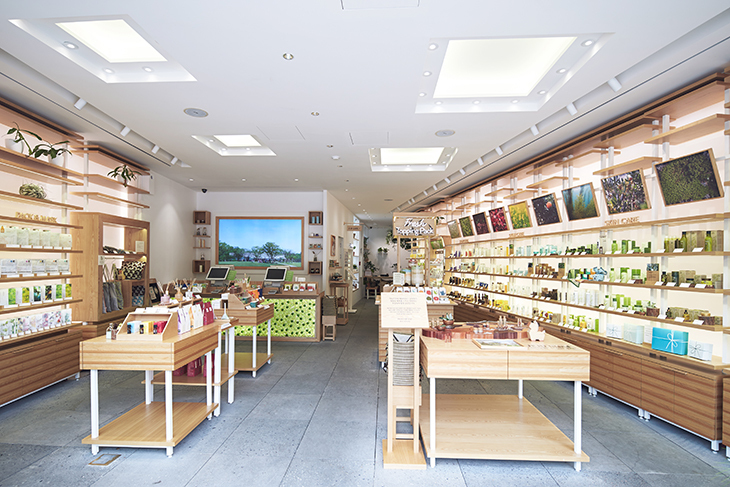 Those who visit will experience innisfree's "green life" philosophy -- the facade recreates the stone walls on Jeju Island, and the lights were inspired by Jeju diver women's harvest basket. The overall design will bring back for the patrons their warm memories of the island.